Blog | Shivam Gupta: MUST SEE: India's satelite pic on Diwali. REAL or FAKE? MUST SEE: India's satelite pic on Diwali. REAL or FAKE? One of my favorite Indian festivals - Diwali. Check out some unbelievably beautiful and catchy images of India shot on Diwali from a sattelite view. It looks like heaven. Got hooked... right? There is lots of shares on social networking sites whether it is real or fake. The answer is: I'm afraid to tell, It is FAKE! India at night, satellite view. 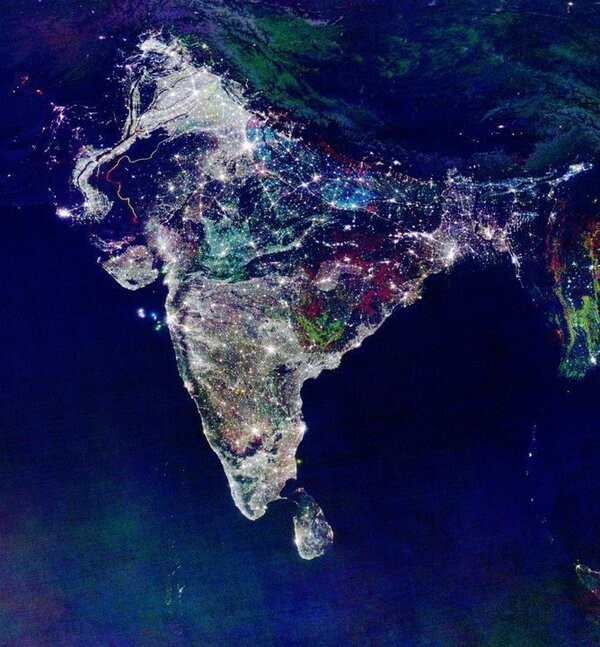 This image is a composite showing the change in illumination over India from 1992-2003. Satellite data from 2003 is coloured red, 1998 is coloured green and 1992 is blue. The three data sets are composited to form the image. "Deepavali or Diwali, popularly known as the "festival of lights," is a festival celebrated between mid-October and mid-November for different reasons. For Hindus, Diwali is one of the most important festivals of the year and is celebrated in families by performing traditional activities together in their homes. For Jains, Diwali marks the attainment of moksha or nirvana by Mahavira in 527 BC"
Wishing all my followers a very happy and prosperous Diwali.